Last major update issued on March 21, 2005 at 04:30 UTC. The geomagnetic field was quiet on March 20. Solar wind speed ranged between 331 and 441 km/sec, steadily decreasing all day. Solar flux measured at 20h UTC on 2.8 GHz was 89.0. The planetary A index was 5 (STAR Ap - based on the mean of three hour interval ap indices: 5.1). Three hour interval K indices: 12122111 (planetary), 13122231 (Boulder). 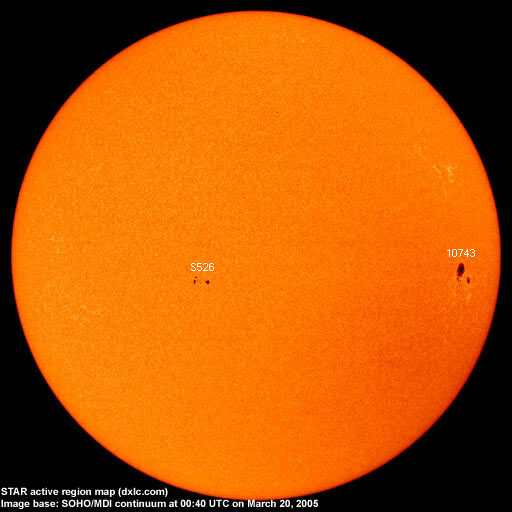 At midnight there were 2 spotted regions on the visible solar disk. The solar flare activity level was low. A total of 3 C class events was recorded during the day. Region 10742 behind the southwest limb produced a C4.1 flare at 01:59 UTC. Region 10743 decayed losing both spots and penumbral area. Flares: C1.2 at 06:14 and C2.1 at 11:52 UTC. New region 10744 emerged in the southeast quadrant on March 19 and was numbered the next day by SEC. The region added some penumbral area on March 20, however, the separation between the opposite polarity areas increased. Unless new flux emerges the region is likely to decay. March 18-20: No obvious fully or partly Earth directed CMEs were observed. A recurrent trans equatorial coronal hole (CH153) will rotate to a geoeffective position on March 21-23, the westernmost part is only in the northern hemisphere and poorly defined. The geomagnetic field is expected to be mostly quiet on March 21-23 becoming quiet to unsettled on March 24 due to effects from CH153. 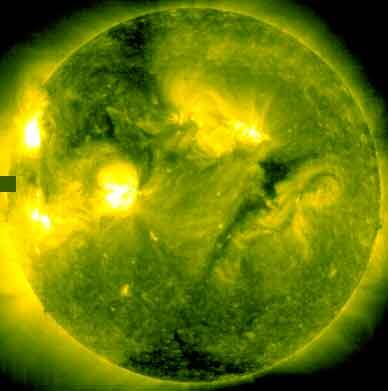 Quiet to active conditions are likely on March 25-26 as the coronal hole effects increase. Long distance low and medium frequency (below 2 MHz) propagation along east-west paths over high and upper middle latitudes is fair to occasionally good. Propagation along long distance north-south paths is very poor. Trans Atlantic propagation conditions are normally monitored every night on 1470 kHz. Dominant stations tonight: Radio Vibración (Venezuela) before 03h UTC with a fair signal, then, gradually, WWNN Boca Raton FL and WLAM Lewiston ME took over dominance. Propagation towards North America is improving and several stations had fair to good signals. Surprisingly CJYQ on 930 kHz was poor and allowed Radio Surco (Cuba) to dominate the frequency.